So here's the low down. Abraham is a pretty old guy who is childless. After praying continuously for a son, God allowed Sarah to become pregnant with Isaac. God blessed Abraham with a son, something his heart had been yearning for. "Take your son, your only son - yes Isacc, whom you love to much - and go to the land of Moriah. Sacrifice him there as a burnt offering on one of the mountains, which I will point out to you." "The next morning Abraham got up early. He saddled his donkey and took two of his servants with him, along with his son Isaac. Then he chopped wood to build a fire for a burnt offering and set out for the place where God had told him to go." Okay let's just take a second to recap what just happened in those two verses. Abraham has a dearly beloved son named Isaac. God tells Abraham to sacrifice Isaac, his only son. The NEXT morning, without any hesitation what-so-ever, Abraham gets up in the early morning and prepares for the journey he is about to go on to sacrifice his son. When I first read this story, I was blown away by Abraham's lack of hesitation. He literally wakes up early the next morning to prepare for the journey the Lord called him to without ANY hesitation. Let's think about this. Isaac is Abraham's son. His beloved son. His son that he had prayed several years for. And when the Lord asks Abraham to give Him the thing the cares most for, he does so without a doubt in his mind. 'Don't lay a hand on that boy! Don't touch him! Now I know how fearlessly you fear God; you didn't hesitate to place your son, your dear son, on the alter for me.'" God chose to save Isaac because of Abraham's undoubted trust in Him. Abraham was tested by God. If you are as unathletic as I am, you know it's probably not the smartest thing to go to a mountain and try to run up the whole thing. You must workout, train, and sculpt your muscles in order to accomplish that task. In order to get in shape to be able to run up the mountain, you must sacrifice your time to workout, eat better, and maybe do some things that you don't want to do because you rather just watch another episode of Grey's Anatomy. What's comfortable and what's uncomfortable? If you are in that constant state of a spiritual valley and have been trying to climb up and see that mountain top, maybe something is holding you back from that. Maybe God has called you to sacrifice something to him in order to reach that place. Being the stubborn Americans that we are, we don't like doing things that are uncomfortable so we have doubt, even though we know what the Lord is telling us to get rid of or stop doing. My only advice to you is to stop doubting and become more like Abraham. 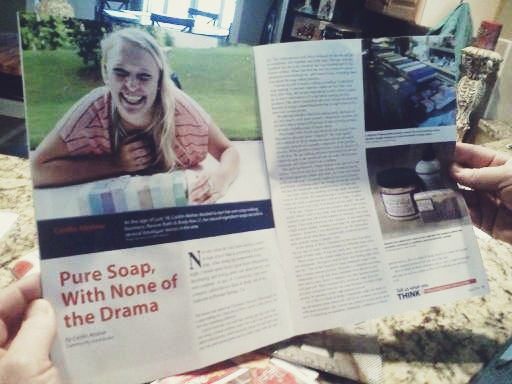 So some of you might know that I have recently been featured in a two page spread of the Lost Mountain Life magazine! Yahoooo! One thing I love most about my job is hearing how my story affects people. I've received so many encouraging emails - thanks guys! I truly cherish each kind word you guys write to me. If you haven't seen the article yet, the Lost Mountain Life magazine is sent to your home if you live locally in the West Cobb area. I hope all of you guys have a Reviving week!